I've been double-dipping into my patterns lately. 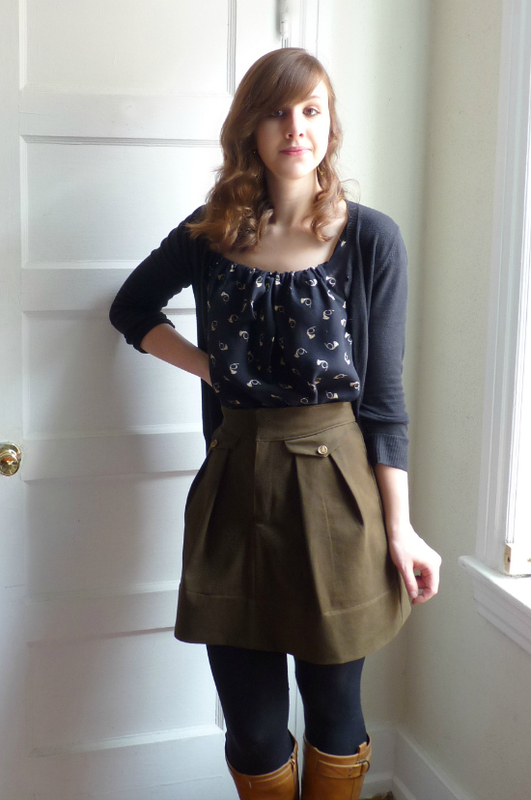 Right after I finished my black Burda pleated skirt, I cut into and finished a second version. I also just made another Archer shirt but we'll save that for another day, maybe. I've been self-conscious with my blogging lately; afraid of posting something uninteresting or repetitive, I don't post anything at all. Then I eventually feel guilty about my silence and post the stuff anyway. So here I am, with photos I took three weeks ago. Ah! Just call me Vampira, with sun-deprived skin that matches her glowing white walls. Save my cold soul, spring. 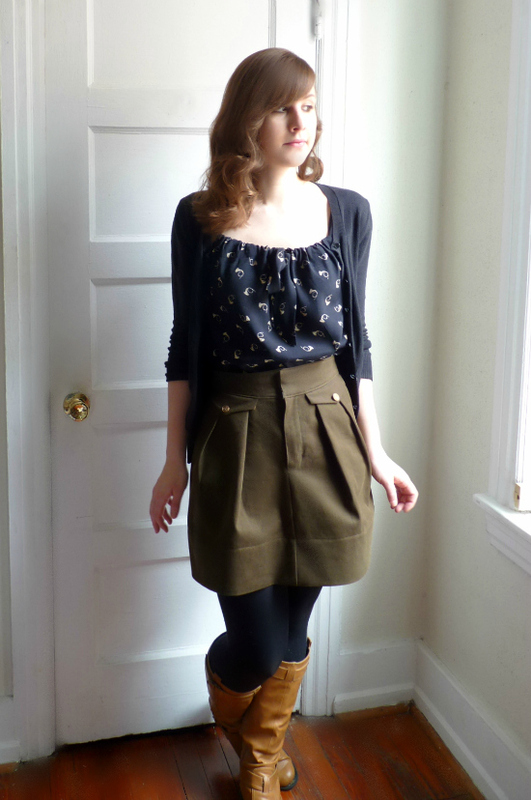 No settings on my camera or positioning of natural light would capture the true green-ness of this skirt. It looks dull brown in all these photos, but it's much more obviously green IRL. Unfortunately that means I don't really have that many tops to wear with it. And I'm not the type to make a camouflage blouse. Don't act shocked now. 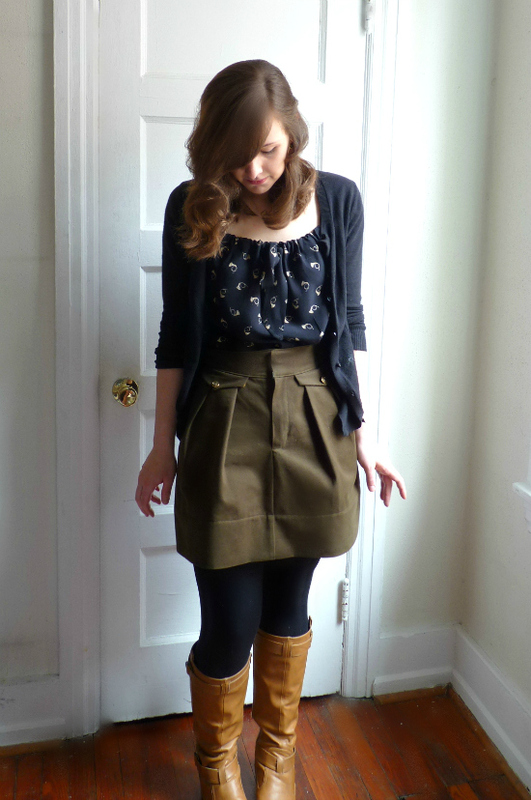 I even copied her boot styling! Her skirt has an elastic waist in the back, but I decided to keep the original design of my own version, though I did omit the faux welt pocket things. 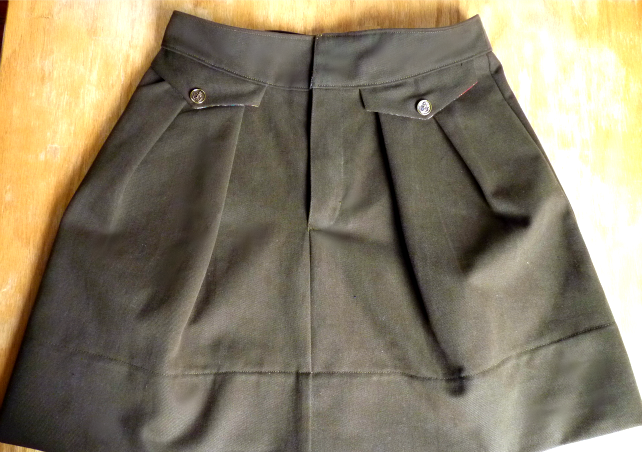 I instead added faux flap pocket things on the front of the skirt. I'm no foe of the faux, you hear. 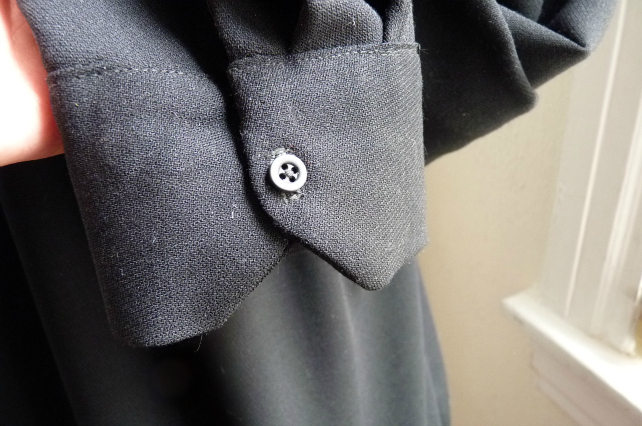 I only had two of these gold buttons, otherwise I would have added them to the waistband closure as well. The waistband and pockets are faced with leftover paisley fabric I used to make my mom a top. (Sorry, Mom, I promise I'll mail it soon...). It's a lightweight floaty cotton so probably not ideal for a waistband facing because it's not very structured. But I like how it complements the more masculine twilliness of the shell fabric. Et voila. Another skirt on the ole sewing resume. Never too many, right? Have you ever made a pattern twice in a row? Of all the fabric in the online world that I could drop into my virtual shopping cart, what are the chances that I could end up with the exact fabric as one of my familiar sewing bloggers? Is it possible that someone else has as good taste as I do? Apparently yes. I was scrolling through my blog reader earlier this year, and saw a post by Made by Trisha in which she announced her "stashbusting pledge" for 2013. Because she is a good blogger, she also posted a photo of the bust-worthy stash -- for accounting or accountability purposes, I assume. Wait, ooh, something familiar! Introducing our S.O.S (Stashbusting Our Sister fabric) Challenge. Everything collaborative you do in the blogosphere needs a catchy title or else it crumbles away in memory and search boxes. Trisha and I have committed to using our same fabric to make a secret item, then we plan to reveal it to each other and the world on April 2nd. I can't wait to see what she makes with it! We may have similar taste in fabrics, but where will our respective creative processes lead us when it comes to choosing (or drafting...?) a pattern for it? Since our fabric was separated at birth, how similar will their personalities be after all this time?! 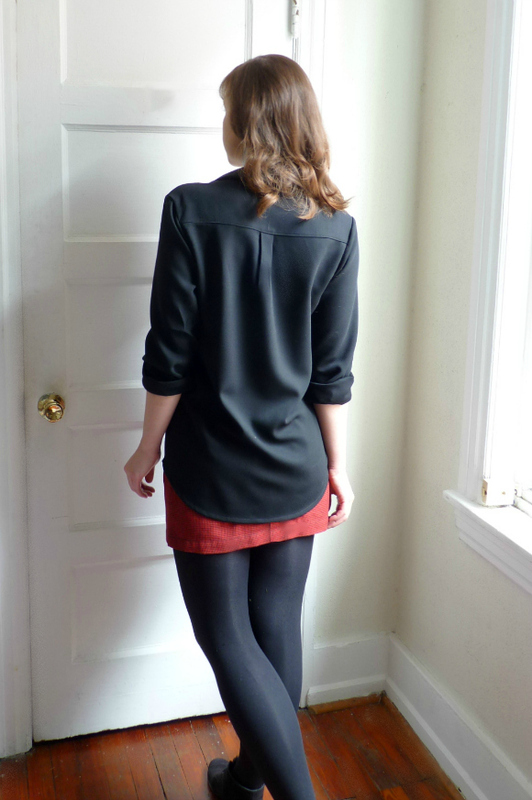 Consensus seems to be a figure-hugging dress with simple lines. 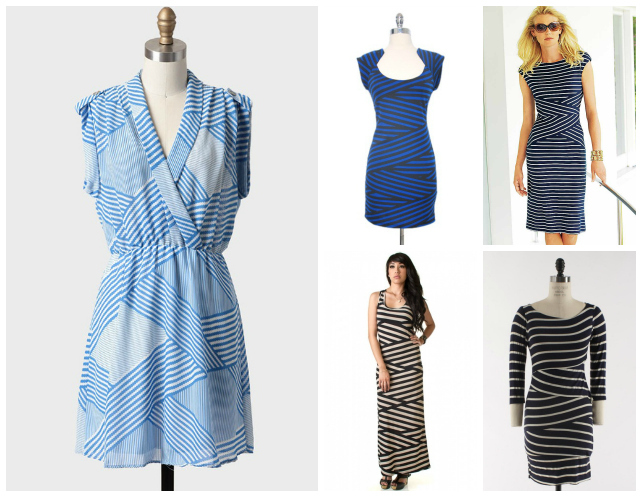 Naturally I'm more drawn to the Ruche dress (far left) that actually has a waist seam and some ease through the hips. But my fabric may be too thick to imitate that drapier style. What do you think? What would YOU do with this fabric? Wait, do you already own this fabric? Hop on over to Trisha's blog to see her announcement of the S.O.S. challenge, and watch our spaces in April for the final products! Wuzzat? 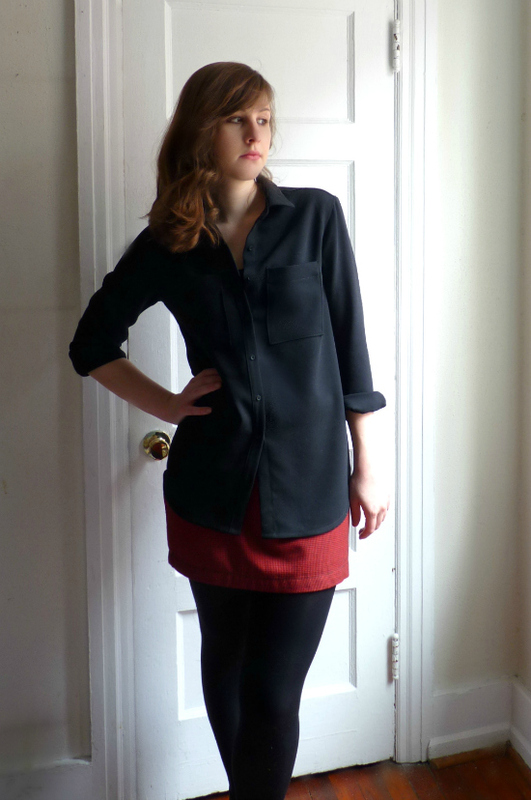 A black button-up shirt. How... classic. Seems to be my theme as of late. 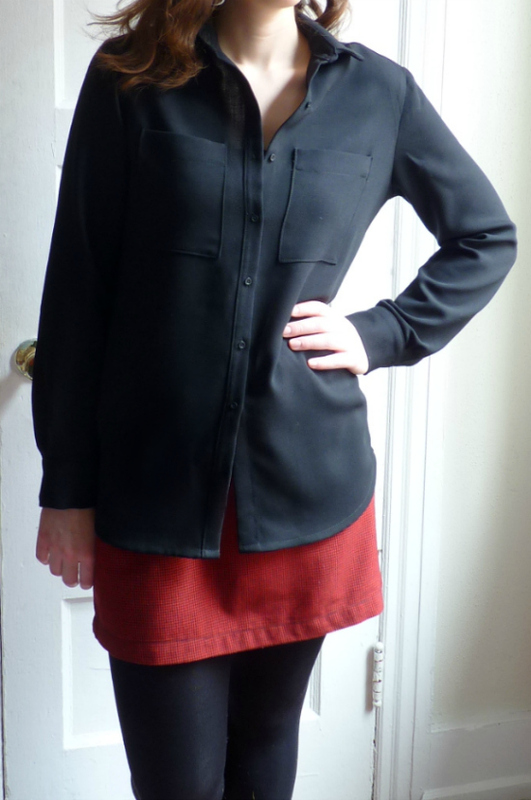 Beige wool skirt, black linen skirt, gray knitted scarf, and now a black button up shirt. AND I LOVE THEM ALL SO MUCH. I recognize this is not my typical silhouette. 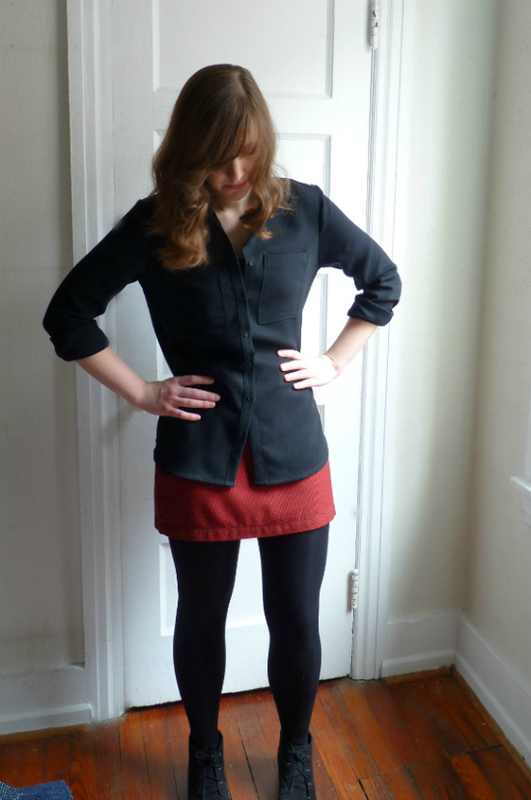 Yeah, where's the pleated A-line skirt, tucked in top, and cardigan?! Oh there's plenty more where that came from. 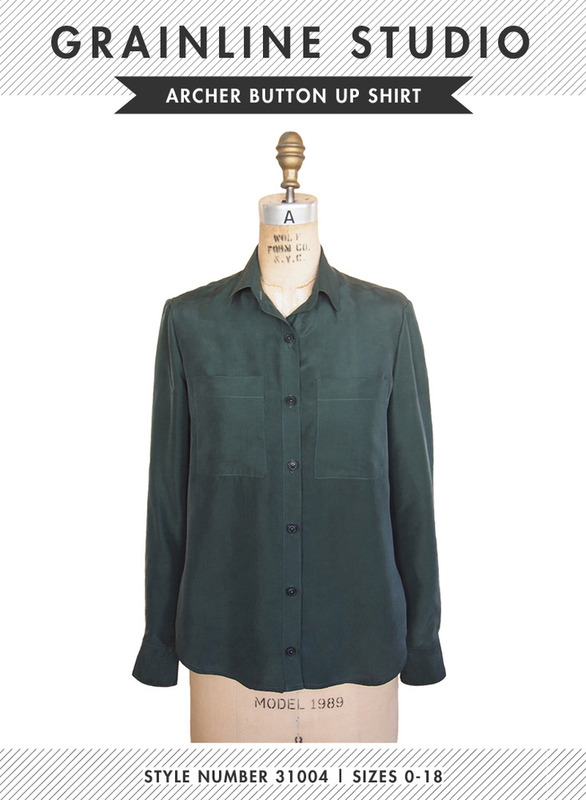 Today I'm going a little 80s and showing you my Archer shirt, a new release by Grainline Studio, which is a loose-fitting boyfriend-style button-up shirt. There's an option for a gathered back panel on one of the views, but I just wanted this one since I own so few basic blouses. I really admire Jen, the designer behind Hound and the patternmaker behind Grainline Studios, so I'm glad I was finally able to make up one of her patterns. Last week I actually downloaded a McCalls blouse pattern that was somewhat similar to this, but when Grainline released the Archer a few days later, I decided I wanted to support Jen's business instead. And it meant all my notches and seams actually lined up during construction - how novel! The only change I made to mine was add 3 inches to the length. The fabric was a Jomar find, so the content is the usual mystery. It's loosely woven but medium-weight, oddly, and is pretty drapey so I'm guessing there's some rayon in there? I made a straight size 4 -- though I should have made a little extra room for my hips. I reckon the shirt is supposed to hang straight down your body, not puddle over the derriere. Because it's a loose fit shirt, it seems the shoulders are supposed to hang off a little, and the sleeves are supposed to be a little long and baggy-ish. That's how it looked when I saw Jen wearing her own versions on Instagram anyway, so I was happy that it fit me similarly in the arms without any alterations. I've probably made five collared button-up shirts by now (the majority of which were actual boyfriend shirts...for my boyfriend), so I'm fairly used to the construction techniques. I'm honestly not sure that if I were a complete newbie to shirtmaking, would I have been able to tackle the Grainline instructions alone without some head-scratching. All the text is clear and comprehensive, but there aren't illustrations for every baby step and sometimes I wished I could "see" more. The cuff placket instructions were kinda confusing to read ahead of time, but once I was actually proceeding with it, it all made sense and came together okay. The angled cuffs on View A are purty cute, huh. 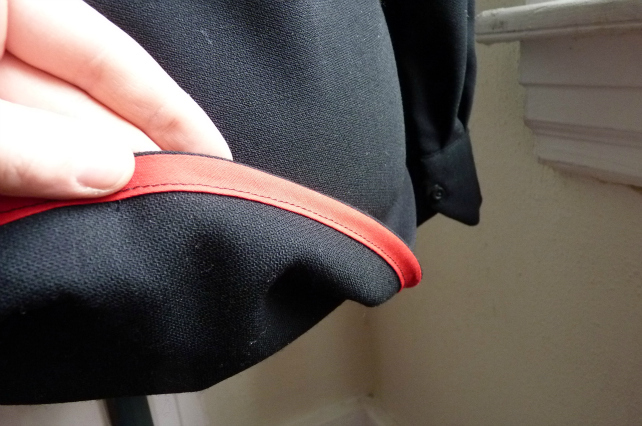 I think the buttonhole is actually supposed to be horizontal on the cuff, but it wasn't clear. Hey, it still functions! The Archer's sleeves are inserted more easily by using the flat method, as is typical for men's shirts, and has a clever under-collar piece that is cut on the bias and smaller than the upper collar so allows the seam to naturally roll under. 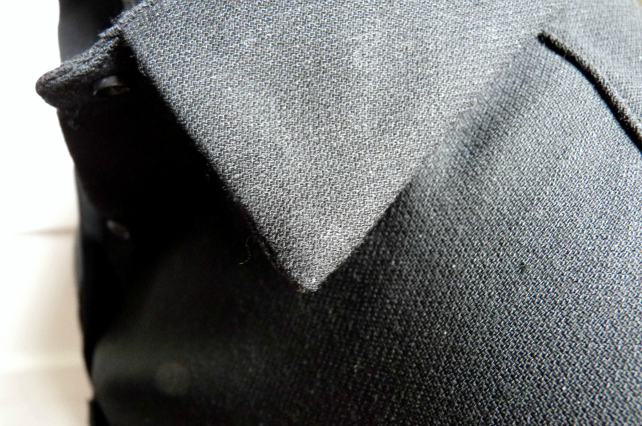 As with all my recent collars, I used Pam's tutorial to get a sharp collar point. It's not foolproof, but for me it yields much better results than poking at the damn thing with a knitting needle or whatever. Are you allowed to hem blouses with single-fold bias tape, or is that just for skirts and such? Well, I did it. Sooooo sue me. 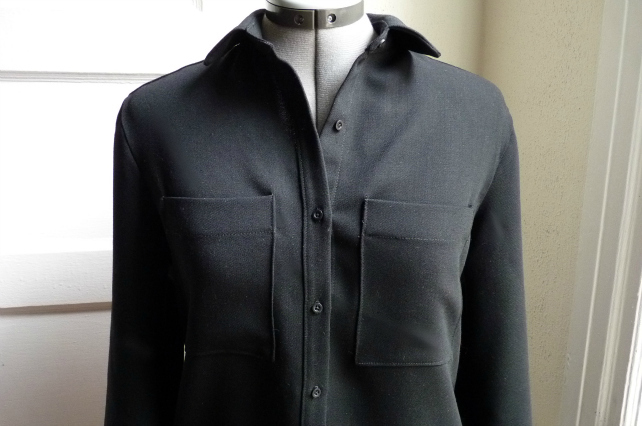 I knew this fabric would be too bulky to fold under twice at the button placket, and I wanted to sacrifice as little length as possible, so I chose to do it this way. With RED bias tape to break the rules even further. Go on, girl. I'm very pleased with my Archer, and I'm excited to make it again with more interesting colors and prints. Now I guess I need to make more fitted mini skirts to wear with it. Oh, like the Moss miniskirt? Now I see what Grainline's trying to do here... it's her evil business plan to make us all dress awesome all the time. What's your favorite Grainline pattern to date? Planning on making this one? Joining the Archer sew-along?